Stand-Up Librarian Meredith Myers Performs Sunday! LOS ANGELES (September 29, 2011) – “So a comedian walks into a library and decides to work there…” Stand-Up Librarian Meredith Myers will be the closing performer at the 10th Annual West Hollywood Book Fair on Sunday, October 2nd at 5:25pm on the Theater Stage in the West Hollywood Library Community Room, 647 North Vicente Boulevard. The event and parking are free to the public. Myers will perform an all-ages literary comedy show…at the library! No cover charge or 2-drink minimum required. 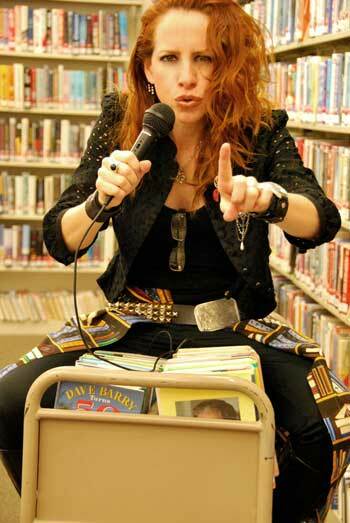 A cross between Pippi Longstocking and Sandra Bernhard, Myers entertains while educates about the importance of libraries as she addresses everything from the Dewey Decimal System to Harry Potter, and her adventures in librarianship! Myers has a Masters degree in Library and Information Sciences and has been performing stand-up comedy since 2002 after checking out a comedy book from her local library. Binding her experiences in comedy and libraries, Myers created www.StandUpLibrarian.com in an effort to showcase how varied, fun, and vital libraries are to our current society and intends to bring an awareness to the often stereotyped library field revealing that librarians are as diverse as the libraries themselves. Through interviews with experts and authors, tours of unique libraries across the country, library and literary-specific stand-up performances and sketches, not to mention plenty of book recommendations, Myers’ unique perspective and humor is perhaps just what libraries need in a tough economic time where city budgets seem quick to eliminate them or reduce staffing. 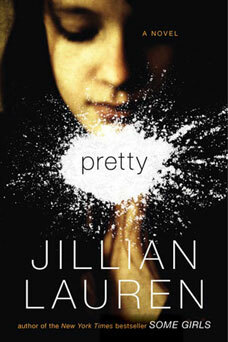 LOS ANGELES (September 29, 2011) – Stand-Up Librarian Meredith Myers will interview Jillian Lauren about her new book Pretty on West Hollywood Book Fair Radio, Friday, September 30th at 1:30pm (PST). Both Myers and Lauren are appearing at the 10th Annual West Hollywood Book Fair on October 2nd. Author and performer Jillian Lauren grew up in suburban New Jersey and fled across the water to New York City. She attended New York University for three minutes before dropping out to work in downtown theater, where she performed with Richard Foreman’s Ontological Hysteric Theater, among others. She is the author of the novel, Pretty, and of the New York Times bestselling memoir, Some Girls: My Life in a Harem, both published by Plume/Penguin. Some Girls has since been translated into fourteen different languages. Myers, a librarian and comedian, has been educating and entertaining people about the importance of libraries. Lauren will be appearing at the West Hollywood Book Fair in the Fiction Pavilion on the panel Fresh Fare From Fabulous Females: New Voices in Fiction, from 10:30 – 11:30am, followed by a signing at 11:30pm. Myers will be appearing on the Theater Stage at 5:25pm. 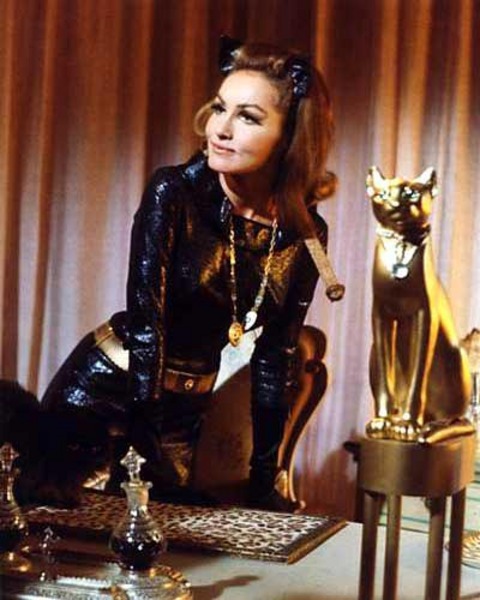 Meredith Interviews Original Catwoman Julie Newmar! LOS ANGELES (September 29, 2011) – Stand-Up Librarian Meredith Myers will interview “Batman's" original Catwoman Julie Newmar about her new book The Conscious Catwoman Explains Life on Earth on West Hollywood Book Fair Radio, Thursday, September 29th at 1:30pm (PST). Both Myers and Newmar are appearing at the 10th Annual West Hollywood Book Fair on October 2nd. Beauty, brains and a fantastic sense of humor, Julie Newmar is perhaps best known world wide for her role as the sultry Catwoman on the hit series “Batman” or on stage for her original roles of Stupefyin Jones in “Lil Abner” and Vera in “Silk Stockings,” not to mention her Tony Award winning performance as Katrin Sveg in “The Marriage-Go-Round.” Myers, a librarian and comedian, has been educating and entertaining people about the importance of libraries, and is a huge Batman fan. Newmar will be appearing at the West Hollywood Book Fair in the Open Book Pavilion on the panel Cats Throw Dark Shadows: From Actress to Author, with stars of the famed gothic soap opera, “Dark Shadows,” Kathryn Leigh Scott (Maggie Evans) and Lara Parker (Angelique Bouchard) from 3:30 – 4:15pm, followed by a signing at 4:15pm. Myers will be appearing on the Theater Stage at 5:25pm. 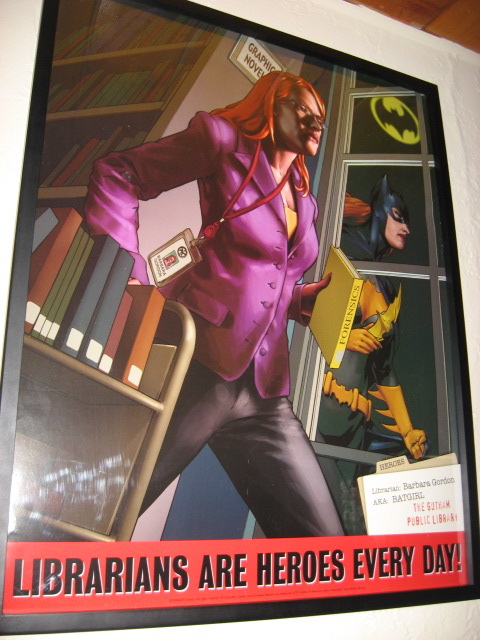 ***Most people may not know that Batgirl/Barbara Gordon has a doctorate in library science and is head librarian at Gotham City Public Library! Above is a picture of me dressed as Batgirl on Hollywood Blvd for my TV pilot I shot in 2008/2009. Below is a poster that hangs in my apt and a picture of my real FL license plate from the 1990's...long before I ever imagined that one day I would become a librarian! 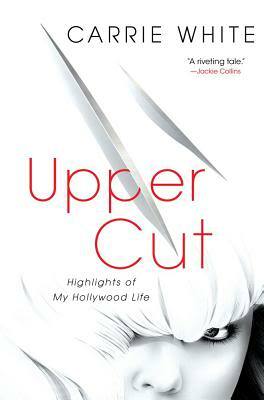 LOS ANGELES (September 28, 2011) – Stand-Up Librarian Meredith Myers will interview legendary hairdresser to the stars Carrie White on West Hollywood Book Fair Radio, Wednesday, September 28th at 1:30pm (PST). Both Myers and White are appearing at the 10th Annual West Hollywood Book Fair on October 2nd. White was born and raised in Southern California. With a career that has spanned more than forty-five years, she’s styled everyone from Elvis Presley and Ann-Margaret to Sandra Bullock and Brad Pitt. Her work has appeared in Vogue, Harper’s Bazaar, In Style, Allure, Vanity Fair, Ladies Home Journal, Mademoiselle, and Glamour. The mother of five, Carrie today owns and operates Carrie White Hair in Beverly Hills. Myers, a librarian and comedian, has been educating and entertaining people about the importance of libraries. White will be appearing at the West Hollywood Book Fair in the That’s Entertainment Pavilion on the panel Take One: Colorful Lives of Wonderful Women On & Off Screen with Dyan Cannon, Florence Henderson and Stefanie Powers from 11:45 – 12:45pm, followed by a signing at 12:45pm. Myers will be appearing on the Theater Stage at 5:25pm. LOS ANGELES – Stand-Up Librarian Meredith Myers will interview Author Jamie Rose about her new book Shut Up & Dance! The Joy of Letting Go of the Lead - On the Dance Floor and Off on West Hollywood Book Fair Radio, Tuesday, September 27th at 1:30pm (PST). Both Myers and Rose are appearing at the 10th Annual West Hollywood Book Fair on October 2nd. 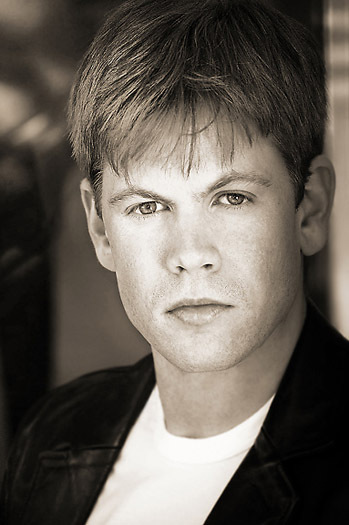 Jamie Rose has been a professional actor for more than thirty-five years. Perhaps best known for her regular rose as Vickie Gioberti in the 1980s prime-time hit series Falcon Crest, she more recently has had lead roles in multiple films and numerous television shows, including ER, NYPD Blue, House, and Two and a Half Men. In love with the same man for more than thirteen years, and married to him for the past five, she lives in Los Angeles with him, their cat, Fenway, and approximately twenty-five pairs of tango shoes. Myers, a librarian and comedian, has been educating and entertaining people about the importance of libraries. Jamie Rose will be appearing at the West Hollywood Book Fair in the Current Events & Hot Topics Pavilion on the panel Possibilities On Finding Paths to a Greater Self from 1:30 – 2:30pm, with signings at 2:30pm. LOS ANGELES – Stand-Up Librarian Meredith Myers will interview Bestselling Author Christopher Rice on West Hollywood Book Fair Radio, Friday, September 23rd at 1:30pm (PST). Both Myers and Rice are appearing at the 10th Annual West Hollywood Book Fair on October 2nd. Rice is the author of five bestselling novels including A Density of Souls, The Snow Garden, Light Before Day, Blind Fall, and The Moonlit Earth. He is also the son of Anne Rice and the late poet and painter Stan Rice. He mostly recently completed his 6th novel to be released next year. A leader in gay rights, Rice is currently a columnist for Advocate magazine and is on the Board of Directors of the new West Hollywood LibraryPark. Myers, a librarian and comedian, has been educating and entertaining people about the importance of libraries. Rice will be appearing at the West Hollywood Book Fair in the Mystery & Suspense Pavilion on the panel: Writing and Selling the LGBT Crime Novel: Should the Label Even Matter? from 2:30 – 3:30pm. Followed by a signing at 3:30pm. Other interview topics besides his new book and participation at the book fair, will include Rice’s involvement with the new West Hollywood LibraryPark, which features an expansive collection of LGBT literature, and finally offer his thoughts on the biggest news of the week – the end of the “Don’t Ask, Don’t Tell” military policy. 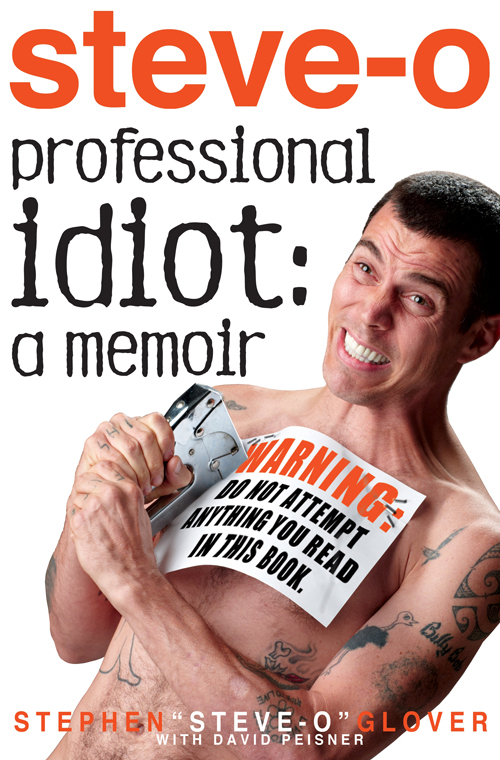 LOS ANGELES – Stand-Up Librarian Meredith Myers will interview “Jackass” star Stephen “Steve-O” Glover about his new book Professional Idiot: A Memoir on Rare Bird Radio, Thursday, September 22nd at 1:30pm (PST). Both Myers and Steve-O are appearing at the 10th Annual West Hollywood Book Fair on October 2nd. Steve-O recently made an appearance on Comedy Central’s “The Roast of Charlie Sheen” and got punched in the face by Mike Tyson. Myers, a librarian and comedian, has been educating and entertaining people about the importance of libraries. Other interview topics will include Steve-O’s current comedy tour and his experiences in stand-up comedy, which Myers has done since 2002 after checking out a comedy book from her local public library. Performing at the West Hollywood Book Fair - October 2nd! MARK YOUR CALENDARS!!! Two weeks from today, I will be the closing performer at the 10th Annual West Hollywood Book Fair on Sunday, October 2nd, 2011 from 10am – 6pm at the new West Hollywood Library and West Hollywood Park, 647 North Vicente Boulevard in West Hollywood. 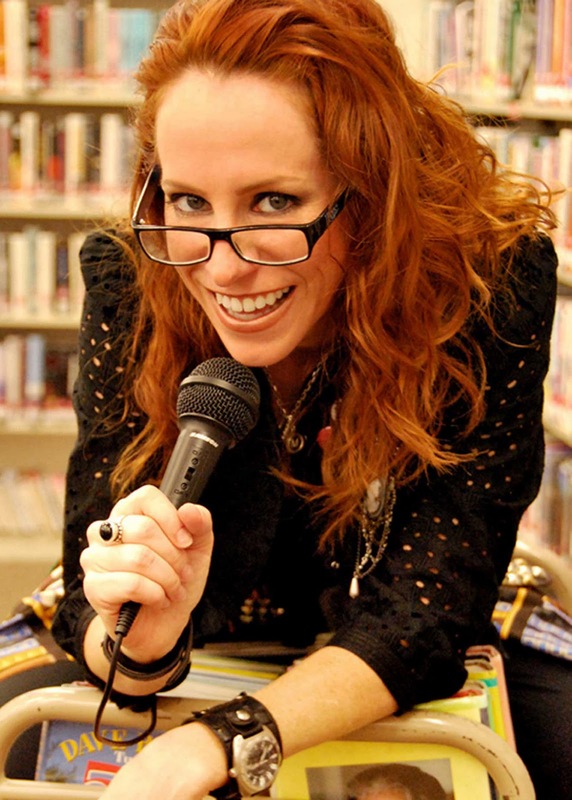 Join Stand-Up Librarian Meredith Myers for an all ages literary comedy show…at the library! No cover charge or 2-drink minimum required. 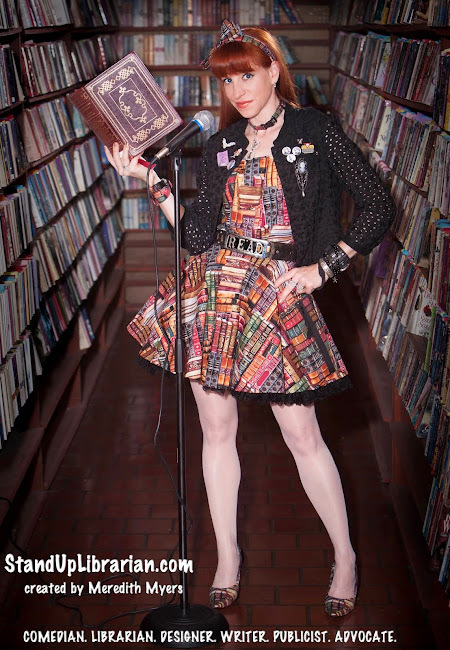 A cross between Pippi Longstocking and Sandra Bernhard, Meredith entertains while educates about the importance of libraries as she addresses everything from the Dewey Decimal System to Harry Potter. Bring a love of reading and get ready to laugh. The West Hollywood Book Fair will feature twelve stages with author panels, special guests and live performances, 125 exhibitors and writing workshops. Featured authors and participants will include Meredith Baxter (“Family Ties”), Marg Helgenberger (“CSI”), Julie Newmar (“Batman”), Tatum O’Neal (“Ryan & Tatum: The O’Neals”), Dee Wallace (E.T. : The Extra Terrestrial), Marcia Clark of the OJ trial, Rex Pickett (Sideways and the new sequel Vertical), and bestselling authors Jackie Collins (The Goddess of Vengeance), Christopher Rice (The Moonlit Earth), Lisa See (Dreams of Joy, Snow Flower and the Secret Fan), and many more. I woke up this morning to MSNBC replaying their September 11th media coverage from ten years ago in real time, making me think in my somewhat sleepy haze that it was happening all over again. It almost stopped my heart at the thought of reliving that awful time full of so much terror and heartbreak. It was a “Groundhog Day” moment but without the comedy of Bill Murray. Without giving it much thought, I chose to voice my hatred of the media and their obvious lack of sensitivity to the families and friends of all of the victims of 9/11 (I mean, who would want to experience that all over again? ), so I innocently went to my FB to voice my opinion – about the media. What happened next is an example of how far we have NOT come. Stand-Up Librarian/Meredith Myers Hey MSNBC, many of us lived 9/11 in NYC, we don't need to replay the entire morning again 10 years later, we know what happened. Stand-Up Librarian/Meredith Myers Geri, I think you misunderstood what I said. I think memorials and tributes are wonderful but replaying the horrific scenes of the pain we all went through is not a positive image. I was there too. My thoughts are with your family and friends. It is terrible that ten years later we are still having problems communicating with each other about these horrific events. Just because I choose not to relive the past via video footage of the innocent people we have lost doesn’t mean that I don’t think it is healthy to remember and honor those people. It just means I think it is far more important to use those memories to encourage action so that terrible things like 9/11 don’t repeat themselves. I believe in making positive changes for a better future by taking responsibility for our actions and living each day to the fullest. Too many people get caught up in things we cannot change instead of focusing on the things we can. I don’t know what makes me more sad at this FB posting with Geri - seeing her pain and poor projection of it at me, or that she is continuing the anger and hatred that started this whole mess in the first place. We were bombed in NYC because terrorists hated America. There was no opportunity for a peaceful discussion or a clarification of why this hatred existed so we could possibly prevent it. We were simply left with adjusting to the results - innocent lives that we will never get back. It is via this opportunity at communication that I’ve decided to repost your FB attack on me, Geri - not to embarrass you, but so you can experience what I deal on a daily basis by choosing to speak my mind in a public forum, opening myself up to verbal attacks on my character without justification. You weren’t even a ‘Friend’ on my Facebook but chose to friend me so you could then attack and threaten me. Sounds like a ton of energy that could have been better utilized by volunteering at your local library or reading to kids. You know, things I do with my time. One sentence shouldn’t be enough of a reason for anyone to make it a personal mission to ruin anyone else’s life, especially one you didn’t choose to clarify before going on a hurtful rant (FYI, maybe you should work in the media, they rarely fact check either.) Trust me Geri, I don’t need your help in not getting a job, I’ve got plenty of things going against me – honesty, integrity, and something called courage. I have no problem standing up to bullies who try to put other people down. I openly admit my faults and mistakes in the hopes others will now know better. And voicing my opinions? That’s not ego, that’s America, baby. Freedom of speech. You don’t always have to agree with it, but in this country, we have a right to say it. Some see Labor Day as the end of summer and a reason to consume baked beans and countless Natural Light by the pool, while others sit glued to the TV watching U.S. Open coverage. Many ladies simply view Labor Day as the last official day to fashionably wear white. Do people still wear white? Or follow this dumb rule? Oh who cares, it is a holiday, so grab a warm Natty Lite and you won’t care if you spill your sister’s homemade baked beans all over your white linen slacks while watching Serena slam a tennis ball at some Czech Republic chick who will soon appear half-naked in Maxim. Isn’t that what Labor Day is all about? According to the United States Department of Labor, Labor Day “is a creation of the labor movement and is dedicated to the social and economic achievements of American workers. It constitutes a yearly national tribute to the contributions workers have made to the strength, prosperity, and well-being of our country.” Wow, for a holiday that celebrates the economic and social contributions of workers, it seems a bit ridiculous that I am spending the holiday alone in my crappy apartment eating a bag of stale Fritos since six out of my nine jobs don’t pay me! And since I am writing this blog post, I am still working! Happy Labor Day to me. Nine jobs you say? Yes. Which means I don’t ever have a day off. Or a life. Or a reason to celebrate. This American Dream is a bunch of BS. I kid, I kid. I just know this hard work without income is so going to pay off one day and I am going to be in a huge mansion living it up for a few months before I die from a broken hip at 90 thinking I have the flexibility of my 24 year-old boy toy that I probably paid for. Now enough of “making it” (success, not whoopee you perverts - get your mind out of the gutter), and let’s focus on right now and how any of this has relevance to Labor Day. Those six jobs that don’t pay me? All consist of the work I am most proud of. Because if I am doing it for free, I must really, really, and I mean REALLY enjoy it! This blog for example. Jeez, if nobody is reading it, they sure as heck aren’t paying me to do it (but you want to send money, I will take it.) The book I have been writing for over a year, is another job that I do daily that doesn’t pay me either. Do I like it any less? Of course not (but I do hope a big publisher buys it, call me!) The same goes with performing comedy in LA (although in NYC I usually got two free drinks but they were pretty watered down so I don’t think that counts.) Anyway, the point is, these are all jobs that I treat with the same respect as any job that pays me a salary…which means at least once a week I quit and then come crawling back. I do however draw the line at stealing my own office supplies – that is just dumb. My volunteer work doesn’t pay me either. I wrote a joke recently that one of the perks of being a volunteer is that it is finally a job that I can’t get fired from. In volunteering for the West Hollywood Library Fund, the West Hollywood Public Library and now the West Hollywood Book Festival, I have learned that my enjoyment for jobs have little to do with the money and more to do with the environment I am in and the people that I work with. Some of the nicest people I have met in the five years of living in Los Angeles have been in these volunteer jobs! Plus, let’s be honest, as a volunteer, I can say no to certain things and not feel bad about it. For example, “No, I will not tell that crazy-eyed homeless man that he cannot steal that little pencil.” After all, there are situations that require people with more authority…and health insurance, should a person get stabbed with that pencil. Labor is labor – whether you are being paid or not. Celebrate it. Life is about experiences and the people you meet through those experiences. If you don’t put yourself out there, you will never get the return on the investment – which most of the time, isn’t about the money at all. I have found in trying to just do the activities that I love – writing, performing, sharing information - I am much happier and less concerned about when or where the money will come. It just does. Sure, I’m still very glad to have the three part-time jobs that I don’t always enjoy just so I can pay the bills, but I put my energy towards the other things that are actually important...like applying for library jobs! Yes, I spend countless hours doing that too. I’m not sure if my “contributions” are adding to the “strength, prosperity, and well-being of our country,” but I hope one day they will. Now doesn’t that earn me some baked beans?